Heavy-duty trimmer is designed for the most demanding trimming projects. Trims up to 30 sheets of standard copy paper. Also cuts card stock, artist black-core mat board, 1/8" foam board and plastic sheets. Patented CARL locking rail mechanism holds paper and paperboards firmly in place while premium carbide blades ensure a precise, accurate cut. 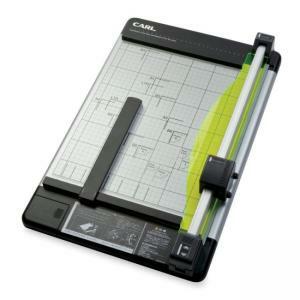 Adjustable magnetic paper guide holds materials on a calibrated sturdy metal base. Great for repetitive cuts. Trimmer features a handy storage compartment for extra blades and cutting mats. Includes a spare cutting mat and straight and perforating blades.